In 1837, R. S. Hudson, a chemist from West Bromich started producing soap powder and selling it in his shop. It was flaked and so dissolved more easily than many other brands of the time. 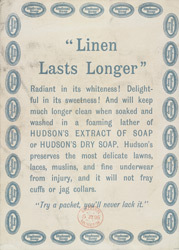 It was very popular and Hudson’s business grew and he opened a small factory in Liverpool in 1875. He produced brands such as ‘Rinso’ and ‘Omo’. The firm was incorporated into Lever Brothers in 1908.